September 18, 2018: CREDAI – MCHI, Apex developers body of Mumbai & MMR, has positioned itself to remain in the forefront of change in Mumbai & MMR’s Real – Estate industry. It aims to make the Mumbai & MMR the most advanced as well as best place to do business in South Asia. CREDAI-MCHI has successfully embarked on a Mission to make MMR the Greener, Cleaner & Happier place vide its CSR arm – Women’s Wing. Women’s Wing has the credit of planting around 6000 trees till now at various places like Beaches, Colleges, Schools, Promenade and Housing Projects etc. The plans are aboard to undertake CSR activities encompassing Green, Clean & Skilled initiatives by Women’s Wing for this year also. 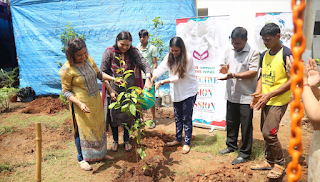 Taking the green initiative, a notch above, Women’s Wing planted over 100 saplings today at Mayfair Aasaan, Aasangaon, the residential property of Mayfair Housing designed considering affordability & convenience & ease of life at affordable price points. The meticulously planned structure sets the project apart from other residential flats in Asangaon. Now with greenery inside with the massive drive of over 100 tree – plantation, Mayfair Aasaan, the project becomes class apart. “CREDAI-MCHI is emerging as a force to reckon with constructing Affordable Housing with discipline & transparency, thus remaining in sync with Hon’ble Prime Minister’s vision of “Housing for All”, at the same time we want to develop such projects which offer the quality of life and ease of living to its residents. Planting of trees on our Mayfair Aasaan project is one such initiative and we with a strong force of our 1800 members, would be taking it up throughout the year,” adds Mr Nayan A Shah, President, CREDAI – MCHI. CREDAI – MCHI strongly upholds its values towards fulfillment of Corporate Social Responsibility (CSR) across Mumbai & MMR with its Green, Clean & Skilled Mumbai.